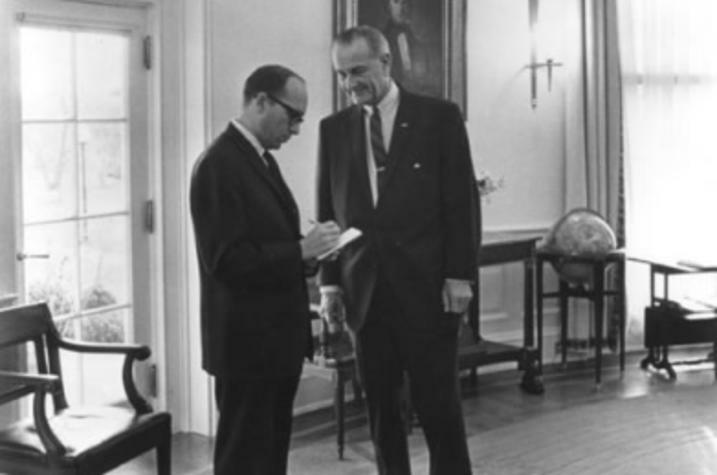 Sid Davis interviews President Lyndon Baines Johnson in the White House. Photo provided. LEXINGTON, Ky. (Aug. 28, 2018) — A journalist who was only 80 feet from President John F. Kennedy as he was assassinated and was chosen to cover the swearing in of President Lyndon B. Johnson aboard Air Force One will be the featured speaker at the inaugural Earle C. Clements Lecture-Symposium presented by University of Kentucky Libraries Wendell H. Ford Public Policy Research Center. Sid Davis will give his free public talk 4:30 p.m. Tuesday, Sept. 4, in the UK Athletics Auditorium in William T. Young Library. Sid Davis writes and lectures on the presidency, the press, politics and current issues in the news. Davis has spent some 40 years as a White House correspondent and news executive. He was a vice president and Washington Bureau chief for NBC News and Washington Bureau chief and White House correspondent for Westinghouse Broadcasting Company. As White House correspondent for Westinghouse Broadcasting Company in November 1963, Davis was in the Dallas motorcade and heard the shots when President Kennedy was assassinated. He was one of the three pool reporters selected to cover the swearing in of President Johnson aboard Air Force One in Dallas, following the assassination. The other two pool members were Merriman Smith of United Press International and Charles Roberts of Newsweek magazine. Davis traveled hundreds of thousands of miles covering nine presidents. He made trips with presidents to Vietnam, the former Soviet Union, the People's Republic of China, Korea, Latin America, the Middle East and Europe. He has served as program director at the Voice of America and as a guest scholar on media at the Brookings institution. Davis started as a reporter with WKBN-TV, in Youngstown, Ohio, before moving up to station news director. He is a graduate of Ohio University at Athens, Ohio, where he was inducted into the Ohio University College of Communication Hall of Fame. Clements’ political career in Kentucky included service as a county sheriff, clerk and judge; terms in the state senate and as governor; and terms in both the U.S. House of Representatives and U.S. Senate, where he was a close colleague to the future President Johnson. The Clements Lecture-Symposium is made possible by the Clements Memorial Fund, a gift from the Abell family: Bess Clements Abell, Clements’ daughter; her husband Tyler Abell; and their sons Lyndon and Dan Abell. In addition to the Clements Lecture-Symposium, the Clements Memorial Fund provides opportunities for Earle C. Clements graduate fellows and interns to present their research at national conferences. The fund builds on the Abells’ philanthropic legacy supporting public service in Kentucky. Other gifts include the Earle C. Clements Graduate Research Fellowship established by Bess in 2007 and the Earle C. Clements Innovation in Education Award administered by the National Archives and UK Libraries Wendell H. Ford Public Policy Research Center.